Your family will enjoy this spacious vacation home located in the Cherry Grove section of North Myrtle Beach. It features a large screened porch and private back yard, perfect for family games and cook-outs.Enjoy the Ocean Drive Difference by starting your vacation immediately upon arrival, as this property comes with fresh bed linens/bath towels, the beds are already made up for you, and the departure maid service are all included in your price. Amenities include 5 TVs (incl one in each bedroom), DVD players, WiFi Internet, and a large kitchen with breakfast bar. Updated furniture will make your vacation relaxing and comfortable, and the upscale decor gives this house a luxurious flare. There are granite accents throughout this lovely vacation home. A big screened porch lets you enjoy the warm summer evenings, insect-free. The beach and public beach access is just a short walk down the road. TJ's is an excellent option for a large family who wants to be close to the beach. This vacation home is located in close proximity to top entertainment and golf courses along the Grand Strand. 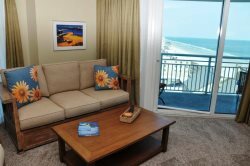 North Myrtle Beach attractions, restaurants, and specialty shops are all just a short drive away! Golfers have the choice of several top-ranked golf courses, all within a few miles of this property. Grocery stores, gas stations, and restaurants are in the neighborhood and within walking distance.